Th Lincoln assassination and it’s cover-up are among the most infamous and misunderstood episodes in American history. They’re also misrepresented and controversial. For instance, everyone knows that the official assassin was John Wilkes Booth and that he was supposed to have shot Lincoln during an afternoon performance at the Ford Theater. part of the plot against Lincoln. What most people still do not realize or take into account is that nine other people were suspects in the trial for Lincoln’s murder. This fact gets obscured in the official myth of Lincoln’s murder, because it does not fit the cover story formula of the lone-nut assassin. The Lincoln assassination’s conspiratorial nature occurred before that kind of tidy narrative was perfected. When it does get talked about, the usual reason for the conspiracy was to revive the Southern cause and to resume the fight against the United States. However, this explanation leads to troubling inconsistencies that have lingered ever since. The fact that Lincoln was facilitating fundamental, structural changes to the money system of the United States–changes similar to the ones John F. Kennedy was undertaking before he was killed– is rarely discussed by mainstream historians. Lincoln instituted a national bank that actually used the government’s constitutional power of creating its own credit without being in debt to the central European banks, This policy, more than any other, created a potent motivation for those above Lincoln in the hierarchy of world power to have him eliminated. Lincoln also had powerful political enemies who did not share his enthusiasm for saving the Union or ending slavery. He also had to fire several generals and officials for their actions, or lack thereof when it came to fighting the war. The prevalence of secret societies like the Knights of the Golden Circle and Freemasonry in this era makes the possibility of wider conspiracy even greater. Secret societies would have given powerful enemies cover, a means to communicate strategy and willing operatives to carry it out. The web of relationships and its wide variety of interpretation make Masonry complex and paradoxical at times. 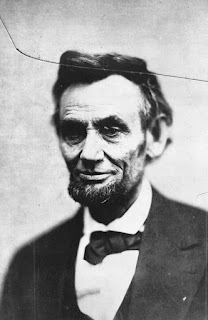 Lincoln was not a Mason, but he voiced his respect for the organization on several occasions. Apparently this opinion was based on the Masonic doctrine of “making good men better.” Yet, as history has shown, evil men will take advantage of an organization like Masonry with its hierarchical structure and institutional secrecy for destructive purposes. Alexander Gardner was one of the foremost photographers of his day. Photographic Sketchbook of the Civil War is probably his most well-known work. Obviously, the war was very profitable for Gardner who supplemented his war correspondent job with fees for soldiers’ portraits while they were on leave in Washington. He was also an early precursor of the post-modern art of creative journalism. Gardner would often transport fallen soldiers to more photogenic locations for his pictures. He’d also arrange entire scenes to get that just-right shot. Ed Spangler the stagehand was also pardoned in 1869. …No one else… had one of the top professional photographers of the era come by to take their mugshots. No one else had the benefit of dramatic backdrops, professional lighting, and flattering poses and camera angles. And no one else was photographed by…Gardner..who took the last known images of President Abraham Lincoln. When called upon to photograph the people accused of plotting against that president, Gardner rose to the occasion. 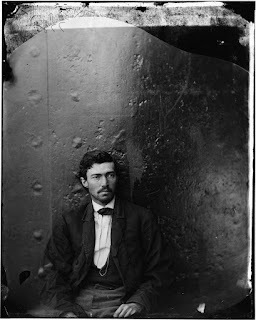 The images of the alleged Lincoln conspirators are arguably the finest work that the Civil War photographer ever did. 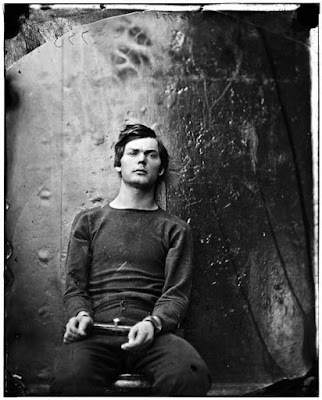 The portraits of the conspirators’ victim, taken not long before Lincoln’s death, are rather lackluster in comparison. 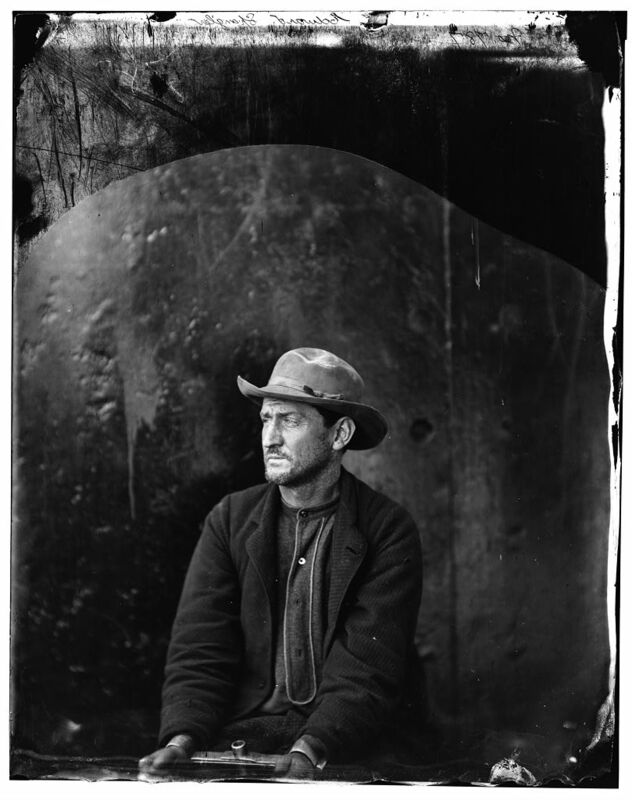 Even though early mugshots were often glamorized, McGowan is right about the contrast one sees in the photos. Gardner’s treatment of President Lincoln, two months before his assassination seems rushed and prosaic when compared with the cinematographic detail and precision of the images of the conspirators. The picture below on the left does capture the fatigue and mental pressure that Lincoln must have been feeling from the war.Gardner’s gift for achieving depth and realism is there also, but the contrast is pretty alarming. Gardner on February 5, 1865. Considering that the accused were tortured, shackled and covered with thick leather hoods to keep them from talking, when they weren’t posing for those well-crafted photographs, Gardner’s conspirators collection is, indeed, very odd. The puzzling thing about the images is why spend all that time and energy to glamorize the suspects? Wouldn’t someone loyal to Lincoln attempt to do the opposite, or at least go for more objective, less contrived photographs? When Gardner was creating these sensationalist newspaper images for public consumption, was he motivated by his own greed, vainglory or was he simply “doing his job” within the accepted norms of his time? Given the photographic evidence and the newly discovered connections, I think we have to consider the possibility that Gardner may have been protecting others by diverting public attention away from them and onto the accused with these extraordinary photos. 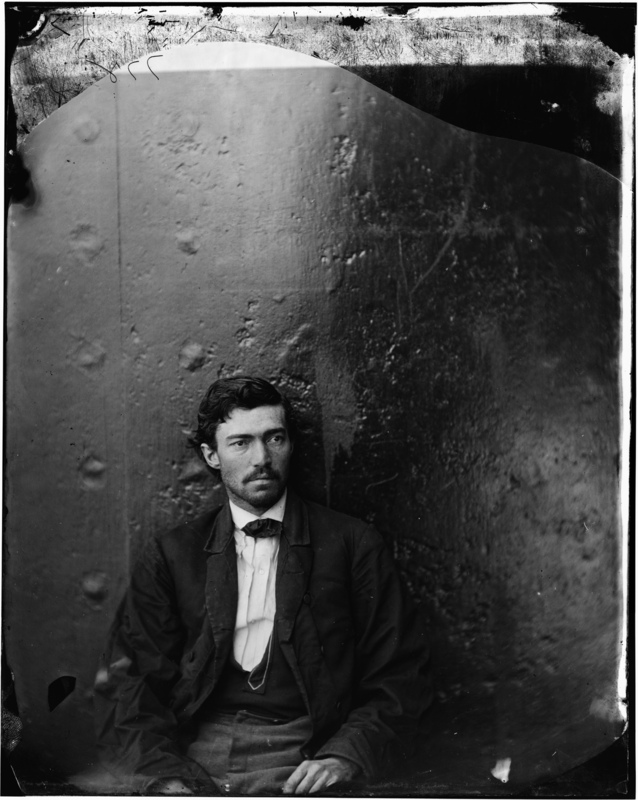 Gardner photographed the conspirators’ execution and the last known alleged photograph of John Wilkes Booth’s corpse, immediately after he was said to have been shot, while escaping. He was certainly always on the scene! However, that particular photo has never seen the light of day. The story goes that once Gardner turned it over to Lafayette Baker and/or Edwin Stanton–you get the picture. In 1868 just after the war, Gardner released Photographic Sketchbook of the Civil War . That’s when he found out that the nation’s interest in the recent conflict did not match his own. It was a commercial disaster. His various bios online note that he became Union Pacific’s official photographer soon after and traveled the West. The photographs of railroad construction, the Native-Americans and townsfolk he met along the way are powerfully engaging. in 1872. His name appears at the bottom. Gardner’s artistry and talent are undeniable. His bios mostly say that after 1871 he gave up photography and founded an insurance company in Washington, D.C. He lived there until his death in 1882. When I read that Gardner started up an insurance company after a successful photography career, I was curious because Gardner was the kind of guy who always had a lot of help around him. I figured this career move was no different. Sure enough, he was not some owner of some small independent insurance company that his bios seem to imply. 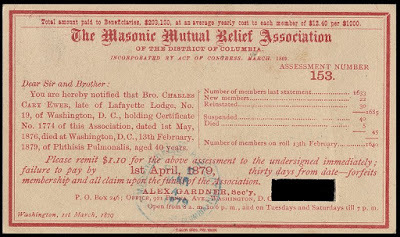 Gardner was the acting head of the Masonic Mutual Relief Association for the District of Columbia. Anyone with that job would probably have to be a Mason, as well. was Gardner’s superior in the world of Masonry. The photo of Albert Pike to the right, in full Masonic regalia, was taken by Gardner in 1880. 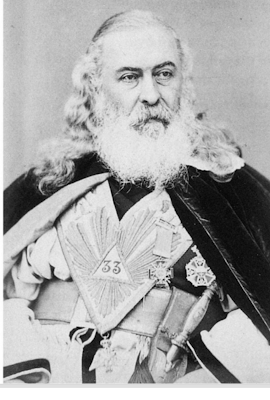 Albert Pike, of course, was the disgraced Confederate general who had to be pardoned by the corrupt successor of Lincoln, “President” Andrew Johnson to keep him out of prison for war crimes committed under his command. Johnson, by the way, was also a Mason. It seems that Gardner would occasionally come out of retirement to snap a pic his old buddies, especially when it involved the august and venerable Albert Pike, who I’ll probably get to in more detail in a future post. Allan Pinkerton was another controversial character connected to Gardner. He was the head of security and intelligence in Lincoln’s administration at the onset of the Civil War. It was Pinkerton who brought Gardner to the attention of Lincoln. One of Gardner’s photographs of Lincoln is the one below, with Pinkerton and Union Major General John A. McClernand. Just as Pinkerton had brought Gardner into the White House circle, McClernand, also a Mason, had earlier done the same for Pinkerton. He’s the shifty-eyed fellow on the left with his hand hidden. 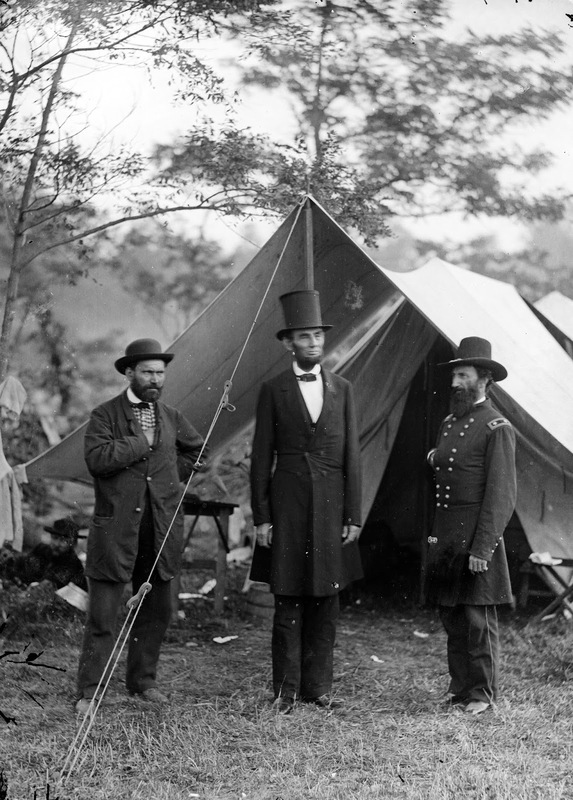 The Major General is the guy on the right looking at Lincoln with his hand hidden. The hidden hand pose was, of course, merely a fashionable visual gesture, in vogue during the 18th and 19th centuries. Napoleon, Karl Marx, British Prime Minister Gladstone, most of the men around Lincoln, were all flashing it. One thing is for sure though, I’ve never seen a picture of Abraham Lincoln with his hand tucked in his suit like that! For a fuller explanation of the symbolism of the hidden hand, read this. The look of disillusion on Lincoln’s face is probably due to the Union army’s embarrassing defeat due in part to the incredibly bad intelligence that Pinkerton’s agency routinely gave Lincoln. How in the world did that happen? In any case, it eventually got him fired. However, both Pinkerton and Gardner found lucrative employment with Union Pacific after the war. It’s all very intriguing to say the least. By the way, McClernand was fired by Gen. Grant for incompetence and insubordination. He tried to get Lincoln to help him, but it didn’t work. I’m going to return to this topic again soon, as there are even more questions, connections and possible answers to discuss. I realize this is a vast subject with commentary and new facts coming out all the time. So, if I’ve missed something, let me know. I’ll take a look at it. After a little digging, I found out that Alexander Gardner was a member of the Baneemytes, a Mormon sect that was led by Charles B. Thompson. The settlement was called Preparation. The Preparation Canyon State Park in Morehead, Iowa is located on its former site. The various bios I found left out those facts. For instance, Wikipedia only stated he was a member of a cooperative community in Monoma, Iowa and that he had returned to Scotland to raise money for the community. He used part of that money to buy the Glasgow Sentinel from Robert Buchanan, another Owenite socialist. The paper appears to have been typical of the partisan propaganda press of the day. So, it appears that not only was Alexander Gardner a closet freemason. He was also a Mormon and a utopian socialist when he was called on to play those roles. “Alexander Gardner.” Kshs.org. Kansas State Historical Society. Web. 24 Jan. 2016. “Alexander Gardner.” Civilwar.org. Civil War Trust. Web. 24 Jan. 2016. McGowan, Dave. “Anatomy of a Presidential Assassination, Part III.” Dave McGowan Archive. Http://www.futile.work, 3 Mar. 2014. Web. 24 Jan. 2016. Notice of Membership Assessment for the Masonic Mutual Relief Association of the District of Columbia, Addressed to Nicholas Boyd Brooks, April 1, 1879. 1879. American Catholic History Research Center and University Archives, Washington, DC. Http://cuislandora.wrlc.org/. Web. 24 Jan. 2016. Porter, Joy: Native American Freemasonry: Associationalism and Performance in America, University of Nebraska Press, 2001.